This weekend I participated in my very first yoga triathlon! It was amazing, challenging, tough and energizing all at the same time. Now you might be wondering what a yoga triathlon is; mine was a yoga sculpt class, a three mile run and then a vinyasa flow class. We didn’t compete against one another, but rather participated in the tri as a community of people who love fitness and yoga. The entire event lasted about 3 1/2 hours and we were rewarded with Jimmy John’s sandwiches, popcorn and trail mix after. The best part was how accomplished I felt; it was only three hours of my entire life and during that time I felt like a complete warrior. Basically I thought I could do anything – AND that is honestly the best feeling. I focused on gaining strength from others around me, reminding myself that I’ve endured worse things and that giving up was out of the question. If you’ve ever hesitating signing up for something, just do it and hold yourself accountable. 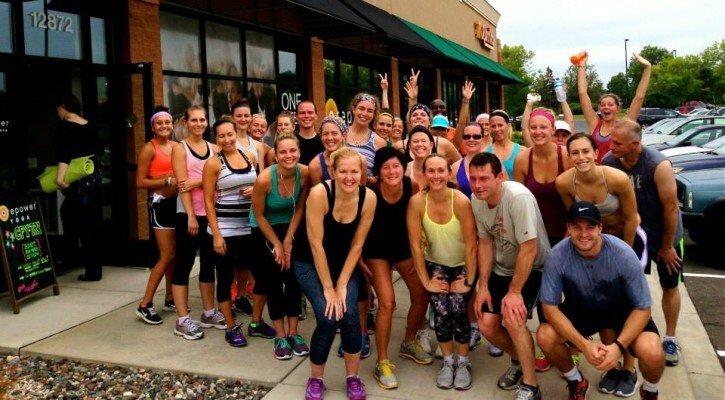 Who cares if you don’t finish first, or if you have to walk the entire way? The point is that you started and you finished; you accomplished and challenged yourself and that in itself will feel incredible. If you do end up signing up for a race or event, make sure you pack lots of snacks because you will be HUNGRY! 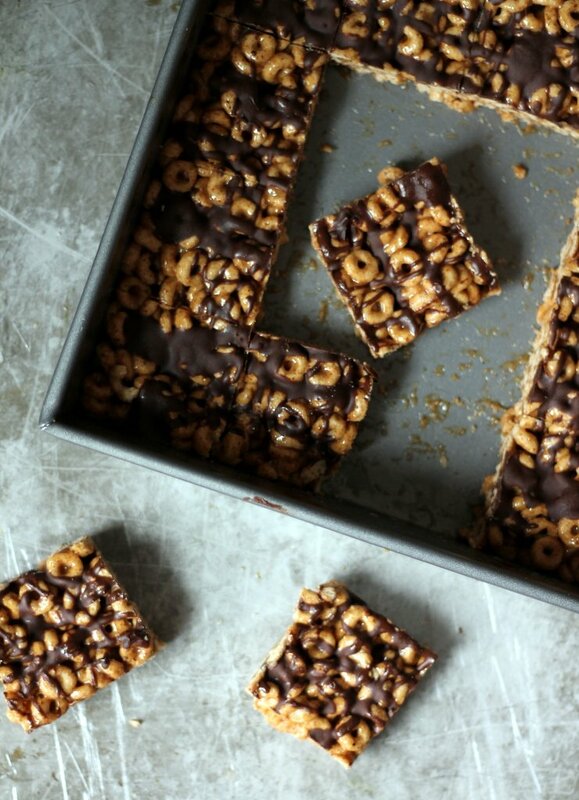 I made sure that I was energized to last through the entire tri by taking it easy the day before, eating lots of peanut butter toast and sprouted grain bread and bringing along a few of these delicious Cheerios bars made with all natural ingredients. I remember enjoying Cheerios as a kid (especially honey-nut!) and couldn’t resist baking bars out of them. 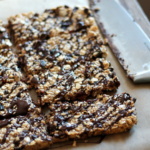 I love that they’re made of oats and they have an awesome crunchy texture that would be perfect for on the go snackin’. Do you guys still enjoy a bowl of Cheerios every now and then? I actually love eating them in my greek yogurt or putting them in my strawberry protein shakes as a protein milk and cereal breakfast. To keep these on the healthy side, I focused on using a few simple ingredients that are easily available and nutritious. -Plain Cheerios. The one and only. -Honey (or brown rice syrup). The key here is that you’ll want it to be sticky so that the bars stay together. I would not recommend agave or maple syrup. -Almond butter. I used the crunchy version but creamy would be great too. I prefer the all natural kind. Peanut butter also works. -Flaxseed meal. You definitely don’t have to add in the flaxseed meal however it adds excellent healthy fats, fiber and protein! I highly recommend it. -Dark chocolate & coconut oil. 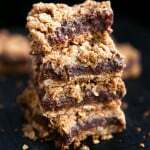 this simple drizzle makes the bars a bit more special, but again it’s totally optional. 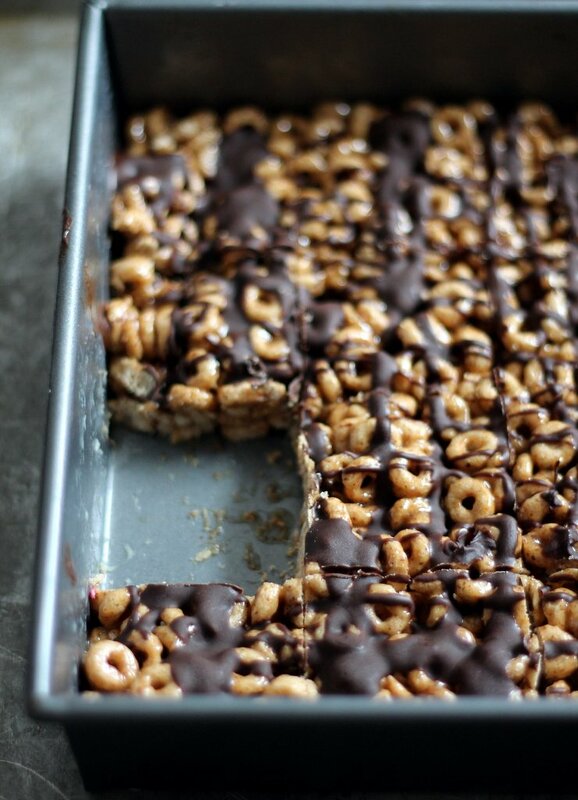 Quite possibly the best thing about these bars is that they’re so dang easy. I whipped them up in 5 minutes, stuck them in the freezer to harden up then was snackin on one 10 minutes later. They were absolutely perfect for my yoga triathlon snack and gave me just the right amount of energy. If you’re into sweet and salty, sprinkle a little sea salt after drizzling the chocolate. You won’t regret it. 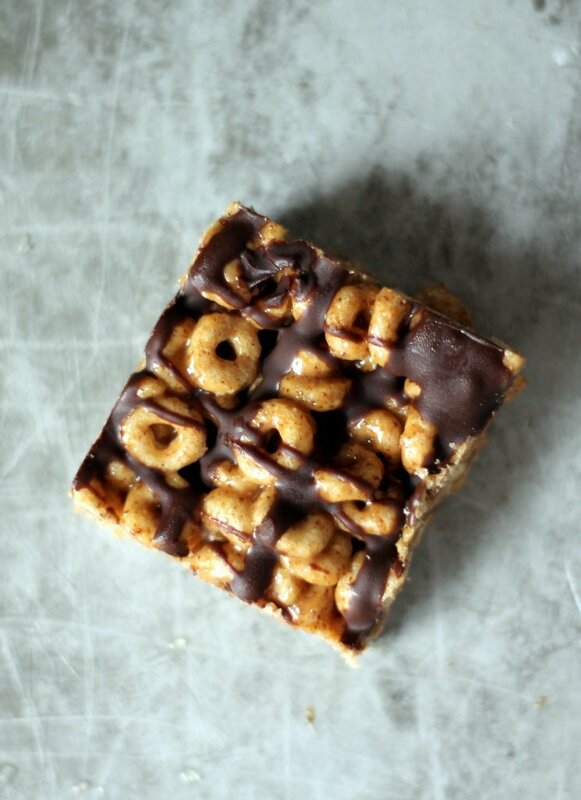 Easy, no-bake cheerios bars made with natural almond butter and honey. The dark chocolate drizzle makes it extra special! Grease an 8x8 inch baking pan with nonstick cooking spray. Heat medium saucepan over low heat and add in honey and almond butter. Stir frequently until smooth, creamy and warm. Stir in flaxseed meal then transfer to a large bowl. Stir in Cheerios. Transfer to prepared baking sheet and press to sides evenly with a rubber spatula to ensure bars are even. Then press very firmly down with your hands. To make the chocolate drizzle, place dark chocolate and coconut oil in a small microwave safe bowl and heat on high 30 seconds. Stir. If chocolate hasn't melted completely place in microwave again in 10 second intervals and stir until melted. 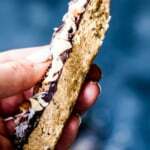 Drizzle or spread over bars however you like. Place pan in the freezer for 15 minutes to help cool bars and harden chocolate. Thaw out a bit if necessary. Cut into 16 squares. Store at room temperature or in the fridge to help keep bars more intact. Enjoy! 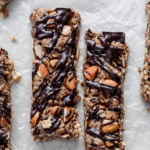 You can leave off the dark chocolate glaze and save around 20 calories per bar. Feel free to use peanut butter instead of almond butter. This post was brought to you by Cheerios and the Power of Oats campaign. All opinions are my own. Thanks for continuing to support Ambitious Kitchen! 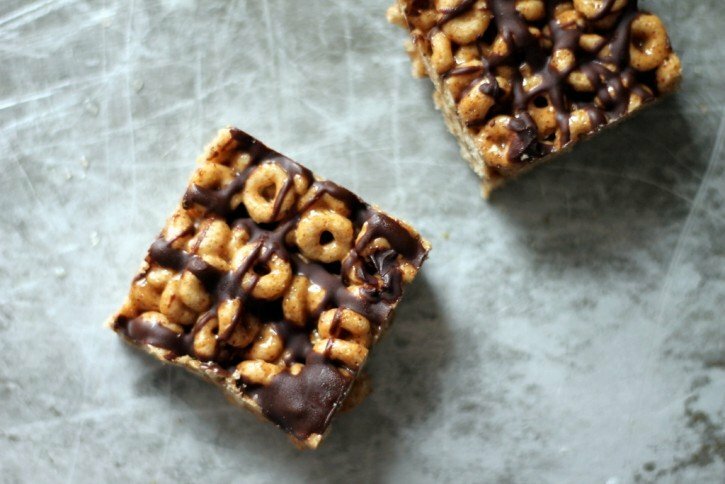 38 Responses to "No-Bake Dark Chocolate Almond Butter Cheerio Bars with Flax"
Would make such a fun and healthy snack for kids. Love this! These were so good and my toddlers loved them too! Honey will work better to help the bars stick together. Do you have brown rice syrup? That would also work well. These were divine! Thanks so much for this great recipe. It was quick, easy, and delicious. I’m a sucker for chocolate/peanut butter along with sea salt. A new favorite! what can i sub for the flax meal? thanks! You can just leave it out. They should be just fine. These are awesome! I use Lyle’s golden syrup instead of honey. 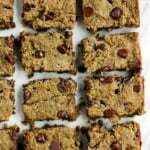 These make a great breakfast bar! Thank you for sharing this recipe! Is there an alternative to flaxseed meal as my partner is allergic to it? I thought maybe he chia seeds but I’m not a fan of the taste! Hi Asia! Flaxseed meal is pretty unique in texture, but you could try using almond flour! 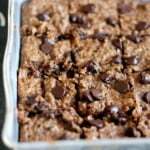 Hi, can i using only the chocolate chips without the coconut oil and spread over the bars. The coconut oil helps the chocolate form a nice “shell,” but feel free to just use the melted chocolate chips. And you can use any nut butter you’d like! I think that should work just fine! Is it ok if I don’t add the nut butter ? The nut butter is what keeps these bars together, so I wouldn’t recommend leaving it out. You can use any nut butter you’d like, though! Absolutely delicious! I used peanut butter and omitted the flax, turned out great! 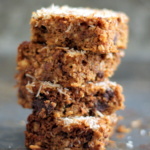 Packed with protein and fiber, it’s almost tastes like eating a candy bar! These were so good ! I used peanut butter and left out the flax. I could have eaten half of a pan! I haven’t tried it, let me know if you do. I wonder if wheat germ would work in place of the flaxseed. When I was a kid a friend’s mom put wheat germ in her chocolate chip cookies and they’ve been my favorite CC cookies ever since! I haven’t tried it, let us know if you do!